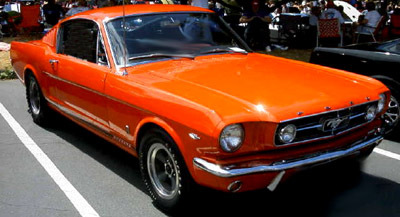 The new 1965 Ford Mustang GT was an immensely significant step for the little pony car and not just for the powerful K code "hi-po" V8 engine options. more under the hood, transforming this pony into a race horse, instead of a "secretary's car" as Caroll Shelby was fond of calling it. But Ford had something special up it's sleeve. 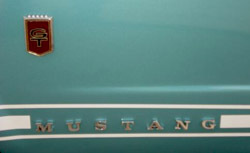 Not just a couple of stripes and a new name, the 1965 Ford Mustang GT had to live up to it's name. Ford created a new easily identifiable styling and accessory package that added stylish and functional pieces to the mix, creating for the time, a truly world class and more desirable car. 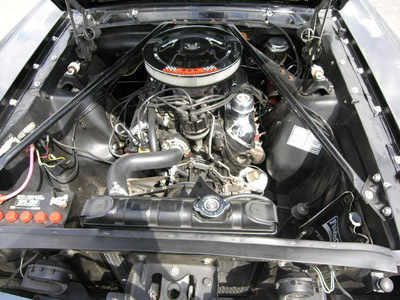 The only way to get a GT Mustang, was to order either the higher performance 225 horsepower 289 V8 with a 4 barrel carburetor, or specify the even more powerful "hipo" Mustang engine, ( A or K code). The now famous K-Code motor (named for the engine's vin code letter seen on the car's serial number) came equipped with higher compression, a more radical camshaft profile and special cylinder heads with screw in studs and other improvements. 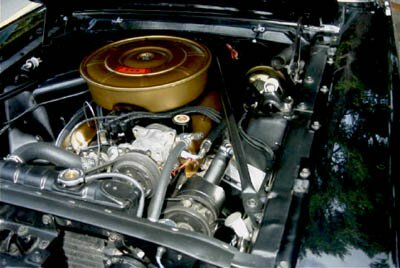 These improvements allowed the small block Ford 289 V8 to pump out a strong 271 horsepower, turning Ford Motor Company's original pony car into a real gran tourismo or grand touring car. Ticking the box for the 1965 Ford Mustang GT package brought you a restyled front grille, with new, built in fog lights, at the front, a special dual exhaust system, with custom chrome and louvered tail pipe trumpets. Add in some tasty color keyed stripes along the lower body line and you had something special. Two other changes help to identify the GT package, with the addition of a GT emblem just behind the front wheel openings, replacing the pony logo and mustang script, with separate chrome letters integrated into the stripe trim. Missing, also, was the chrome styling trim at the front of the rear quarter panels. But that wasn't all. At the rear, there was a new racing style GT logo gas cap. A real grand touring car, can't have an ordinary suspension and braking, so first came a pair of new front disc brakes, guaranteed to stop quicker and significantly reduce brake fade. The GT optioned car's suspension received the performance treatment too, including the addition of a heavy duty suspension which included a thicker front sway bar to prevent body roll in hard cornering. 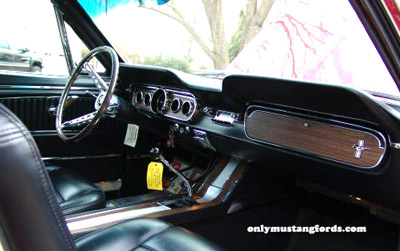 While most of the standard 65 Mustang's interior was retained, there were a few notable additions that made it easy to tell there was something interesting about this particular pony car. A quick look at the dash revealed a new, restyled dash cluster with round faces and separate speedometer, ammeter,water temperature, fuel gauge and oil pressure gauge, instead of the grocery getter unit, plucked directly from the Ford Falcon parts bin. 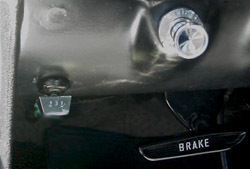 At the lower dash area, was a small chrome switch for the added fog lights, and a rubber "disc brake" designation on the brake pedal. All these things added up to a very special and popular car. Although there were no more than 5% of the entire production devoted to the 1965 Ford Mustang GT package, it has become one of the most desirable and collectible Mustangs around (and the most copied).